Organized by HEC Paris, AXESSIO Innovation Strategies Division and the French Ministry for the Economy and Finance. 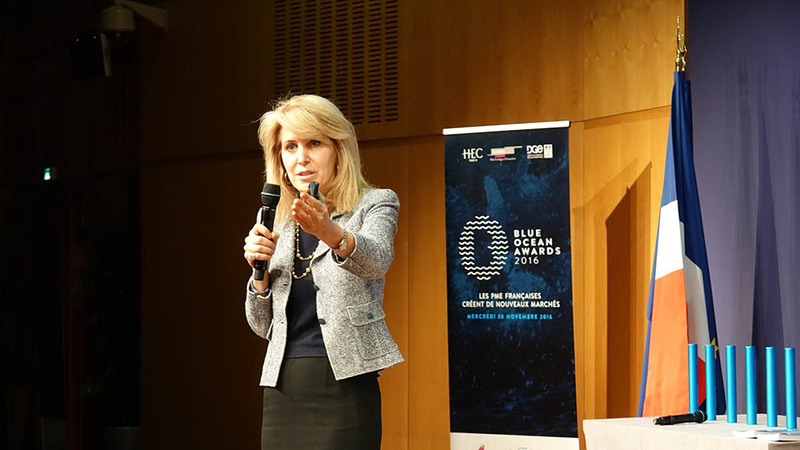 The world-renowned Blue Ocean Awards set up a competition to support French companies creating new markets by offering innovative services or products. For the fourth consecutive year, this major event revolutionizes entire industries in promoting ambitious and promising projects: 90% of the companies who won the Blue Ocean Awards obtained a financing of more than one million Euros within six months. Companies wishing to apply must be registered in France and must have already launched their products or services. The event is co-organized by the world well-known business school HEC Paris, the global consulting firm AXESSIO Innovation Strategies and the Directorate- General for Enterprise of the French Ministry for the Economy and Finance. The Blue Ocean Awards are inspired by the global best-seller Blue Ocean Strategy from the authors Professor W. Chan Kim and Renée Mauborgne. Their researches on Value Innovation allow any company to break free from its competitors by proposing a divergent offer to non consumers in its industry. The 20 finalists will be invited to pitch to the jury throughout the month of October 2017. The Awards-giving ceremony will take place during the gala evening of Friday, December 8th, at the Ministry for the Economy and Finance in Paris, France. This year’s jury will be presented by prominent entrepreneurs and global experts including: Jean-Michel Dahan (Deputy Director at the French Ministry for the Economy and Finance), Stéphane Madœuf (Professor HEC Paris), Alban Eral (Director of the AXESSIO Innovation Strategies), Angélique Bague (Head of the Hewlett Packard Enterprise France start-up program), Maximilien, Nayardou (Finance Innovation R & D Director), Vincent Richard (President of B1 Partners) and Laure Reinhart (Director of Innovation Partnerships at bpifrance). Blue Ocean Awards allows innovative French companies to benefit from support to navigate to new horizons!